Josh and Brett Morris would like to stay together at the Canterbury Bulldogs beyond 2018, but if forced out they'd prefer to remain in the NRL rather than finish their career in the Super League. The Kiama juniors will explore the option of putting themselves up as a "package deal" at the Bulldogs or at another Telstra Premiership club as neither twin is keen to uproot their young family and head overseas. 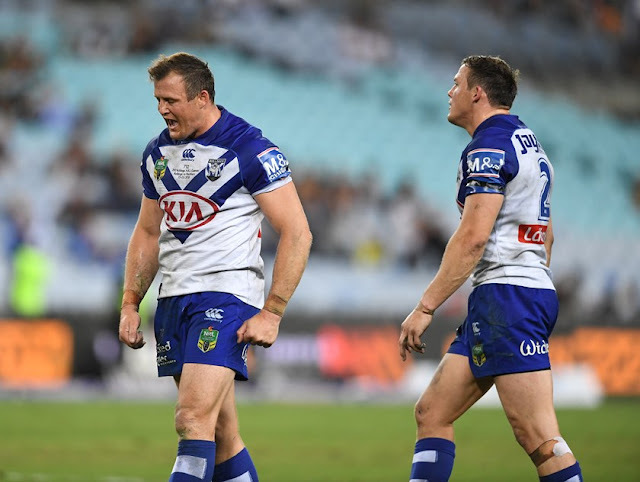 However, the off-contract duo's preference is to remain at Belmore beyond the four years they have enjoyed together since Brett followed his brother from St George Illawarra. The Bulldogs have begun preliminary talks with David Riolo, who manages the brothers, but the club's hands are tied financially. There is little wiggle room for 2019, even with the salary cap rising from $9.4 million to $9.6m, because of the number of back-ended deals done by the previous Dogs administration. The Morris brothers are on around $700,000 each and since they both turn 32 before the season ends, they are aware a pay cut is probably on the cards. But one thing they are not compromising is their quality. Josh has touched down five times in as many rounds to be his side's leading try scorer and already has his name at the top of the club's "speed board" at training. "I had some good results in the gym during the pre-season as well. That was one of my goals heading into the season, now that I'm the oldest at the club, to show the boys that if I can do it, they can keep pushing and get through it as well," Josh told NRL.com. "I dropped a bit of weight too. If you keep the strength while being a bit lighter you gain a bit of power; a bit more acceleration." Brett is feeling the best he's been in a few years. "Physically and mentally I feel in a really good spot … had a great pre-season and looking to play some great footy," he said. "The results haven't been the best as a team but personally I feel like I'm getting better each week." The brothers patrol the Bulldogs' left edge at centre and wing. Josh requires one try in Saturday night's round-six match against North Queensland in Townsville to become only the third player after Hazem El Masri (159) and Terry Lamb (123) to score 100 tries for the club. "I've just been in the right place at the right time – just popping up in the best place," Josh said. "Some years you have your droughts, some are purple patches. I guess I'm in one of those patches now so I hope it continues." Although they are keen to be on the same side again next year, Josh said: "It would be nice to stay together but it's a business so you can't get your own way all the time." "We have talked about it. At our age you've got to be a realist that you might not end up playing together next year," Josh said. "There's the option of heading overseas. I guess the only way to get a good deal is to play some good football so that's the main focus." Wherever they end up, they would like to sign a deal sooner rather than later. "You'd like to have it done and dusted before mid-year, especially with a young family, if I have to move then I have to settle them," Brett said. "We've got to look at all options – see what interest is out there."